Singer Celestine Donkor believes the dress code of some gospel musicians have come under heavy criticisms because they lack knowledge in fashion. She says although gospel music industry has evolved over the years, the dressing of some musicians needs a second look thus the constant criticisms. Answering a question on the public ridicule of some gospel musicians, particularly female musicians fashion sense, the ‘Okronkronhene’ hit singer said they simply lack knowledge. 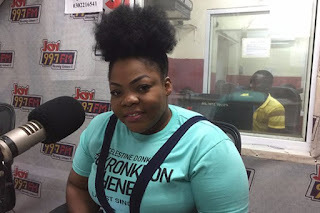 “I will not blame those who do that because they do not know,” Celestine Donkor told Doreen Andoh in an interview on the Cosmopolitan Mix on Joy FM on Tuesday. “Most of us attained this our career path by chance. We don’t have education, we don’t have costume managers. We are not managed properly so we take our personal decision on what to wear and all that,” she said. The singer noted that the solution is not to insult the musicians but rather “educating” them on how to dress properly. While she won’t give herself a perfect score when it comes to fashion, she says she always dresses comfortably.